Depart Cork Airport at 05:50 on a flight with Aer Lingus to Amsterdam. On arrival, you will take your coach transfer to Maastricht. Your hotel in Maastricht for your 3 night stay will be The 4* Golden Tulip Apple Park. After check-in, the rest of the day is at leisure. Enjoy the sights and sounds of Maastricht, on what will be the best weekend of the year to be in this wonderful city. The fans in Maastricht for Andre Rieu's outdoor concerts will create a wonderful and joyous atmosphere. In the evening, make your way to Vrijthof Square for the Andre Rieu Concert and take your seat for this marvellous experience of music, song and humour with the world's best loved classical star. A full day in Maastricht to enjoy this beautiful medieval city. After some last minute shopping or sightseeing, say goodbye to Maastricht as we set off back to Amsterdam. The single supplement for The Golden Tulip is €199. Checked Baggage 15kg - €55 per bag for return trip. Booking deposit of €300 per person is due at the time of booking. The balance is due 10 weeks before departure. The hotel comprises a total of 166 rooms set over 7 floors. Guests are welcomed in the spacious foyer with 24-hour reception desk, a safe and lifts. Facilities on offer include a TV room, a café, a restaurant, public Internet access and a Gym. This attractive hotel is located about 1.5 km from the famous city centre of Maastricht and is in the heart of Limburg's green countryside. The hotel is surrounded by numerous wonderful parks, and is situated within the historic triangle of Aachen, Liege, and Maastricht, and is therefore easily accessible by either car or public transport which is nearby. For the convenience of Stein Travel Guests, we have arranged a regular complimentary Shuttle Bus service from the Hotel to Maastricht city centre during the daytime. The comfortable rooms include an ensuite bathroom with hairdryer. Additional facilities include a direct dial telephone, a radio, satellite/ cable TV, a radio and an Internet connection. A fridge, twin/double rooms, central heating, and a hire safe are also provided in all of the carpeted accommodation units as standard. The Crowne Plaza is uniquely situated on the bank of the river Maas, with an excellent view of Maastricht. Guests can avail of our convenient parking facilities, excellent service in our in-house bar and restaurant, and will find themselves in the perfect location for strolls along the river on the Maaspromende. There is also a fantastic selection of delicious dining options and high street shopping in nearby Hoogbrugstraat and Rechtstraat. 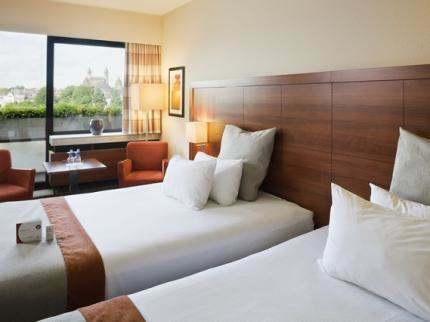 For luxurious hotel rooms at the heart of Maastricht, look no further than the Crowne Plaza Maastricht. With a selection of bedrooms designed to accommodate all visitors. Spoil yourself with international and local cuisine, prepared with fresh and seasonal products. Your pleasure is heightened even further by the restaurant's evocative ambience and its magnificent view across the river Maas. On sunny days many passers-by find it difficult to resist dropping in at the terrace of 'de Mangerie' and the hotel bar 'Le Club d'Artagnan'. The choicest ingredients and excellent service combined with a breath taking view ensure a delightful atmosphere.